What pairs best with Carlsen Center Presents shows? Dinner, of course, and a gourmet one at that! 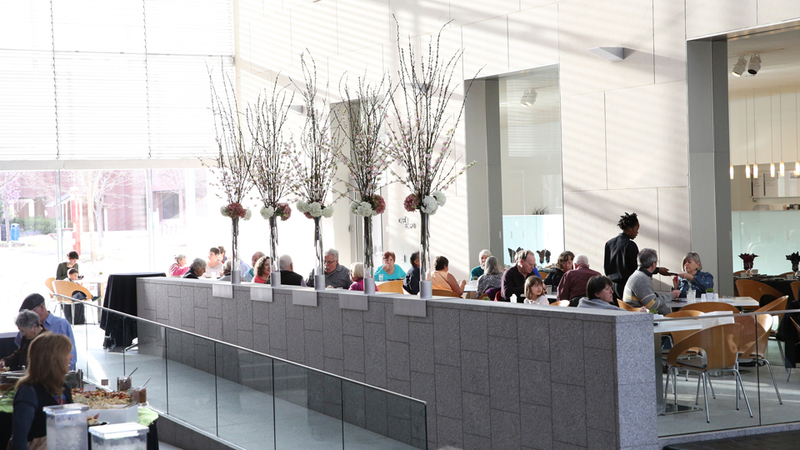 For select performances during the season, Marc McCann, JCCC’s executive chef, prepares a fantastic three-course meal for patrons to enjoy in JCCC’s Café Tempo, located between the Nerman Museum of Contemporary Art and the Regnier Center. Many times, the menu matches the theme of that evening’s show, and wine and beer are always available at a cash bar. Seating for dinner begins 90 minutes before the curtain goes up, which is ample time to enjoy your meal and find your seat in the theatre. A golf cart shuttle is available for patrons who need assistance getting from Regnier Center to Carlsen Center. Carlsen Center pre-show dinners require a prepaid reservation by noon of the preceding Wednesday. Call the JCCC Box Office at 913-469-4445. If you would like to be seated with a specific party, please make your reservations together and indicate your preference. Convenient, free parking is available in the Carlsen Center, Regnier Center or Galileo’s Garden parking garages. Show your Carlsen Center ticket for that evening’s performance to your server and receive a special patron’s discount from Garozzo’s Ristorante. Garozzo’s Ristorante - Garozzo’s quickly became well-known as the originator of its signature dish, Chicken Spiedini, which has become a Kansas City staple. Rated by Zagat as one of the top Italian restaurants in the country, it was described as “food so good, you will taste it in your dreams … in a Sinatra’s kind of hangout.” Find all your favorite Italian dishes and splurge on dessert. Trofi Restaurant - Located in the Doubletree Hotel, Trofi Restaurant offers a diversified menu of regional cuisine serving inside the dining room or casual seating is available outdoors around the fire pit. Trofi Restaurant also offers a private dining room for up to 14 people. Barley’s Kitchen + Tap - Microbrews, macrobrews and imports from all corners of the globe make up an impressive selection of beer at Barley’s. Since 1995 it has served made-from-scratch dishes that feature hand-cut steaks, house-made sausages, focaccia pizzas, a variety of appetizers and small plates, Windy City pies (pizza), sandwiches, and traditional entrées and salads. Grinders Stonewall - Grinders Stonewall is where art, music and food collide! An eclectic menu matches the atmosphere and includes grinders (of course), pizzas, Philly cheesesteaks, pork sliders with mango coleslaw and a smoked barbecue brisket sandwich—as well as a beer garden, complete with its own bar, outdoor games and a fire pit. Minsky’s Pizza - Made-to-order gourmet pizzas with choice meats, fresh-cut veggies, savory sauce and a choice of dozens of toppings are why Minsky’s is regularly named one of KC’s top pizzerias. Thin, original or deep-dish scratch crusts and full bar have made Minsky’s a local favorite for more than 40 years. Ricco’s Italian Bistro - This unforgettable hideaway located in the center of Overland Park has an extensive menu that features many customer and chef favorites, from house-made salad dressings to savory sauces and wood-fired pizza. Everything is made in small batches and with love. Ask your server about the latest creation. The menu is complemented by a global wine selection, including 25 varietals served by the glass. Sawasdee Thai Cuisine - Sawasdee takes pride in maintaining authentic flavors and traditional Thai service. The warm and sophisticated atmosphere has been designed to enhance your dining experience. Menu items appeal to a wide variety of tastes and include curry dishes, soups, salads, vegetables and dipping sauces served along with fluffy white boiled jasmine rice. The dishes feature five distinct flavors – bitter, salty, sweet, sour and hot – to create a harmony of tastes, colors and textures. Talk of the Town - Cutting-edge cocktails and more than 80 kinds of beer accompany fresh, quality food at affordable prices. Everything is made in-house, including cheese sticks and made-to-order mac and cheese. Never-frozen meats include chicken, beef and salmon. Tanner’s Bar & Grill - This friendly purveyor of good times, fine food and “the pause that refreshes" features late-night hours, daily food and drink specials, and numerous TVs always showing your favorite game. The food is tasty, the beer is ice cold and the service is always friendly. Take a peek behind the bar – you just might see Grandpa Tanner serving up drinks and chatting with the customers, just as he’s done for more than 25 years! Tequila Harry’s - Tequila Harry’s offers Mexican food and drink specials every day and has an extensive menu for you to choose from. Enjoy sizzlin’ fajitas, tacos, enchiladas, burritos, fajitas, fried ice cream or even a cheeseburger. Twisted Fresh - Twisted Fresh is known as the perfect inexpensive dining option for eating healthy without sacrificing flavor. Fresh premium ingredients are used to craft "twisted creations" including gourmet tacos and wraps, burgers, salads and chicken sandwiches.